It’s Sunday and I’m starting the week with some exciting news! 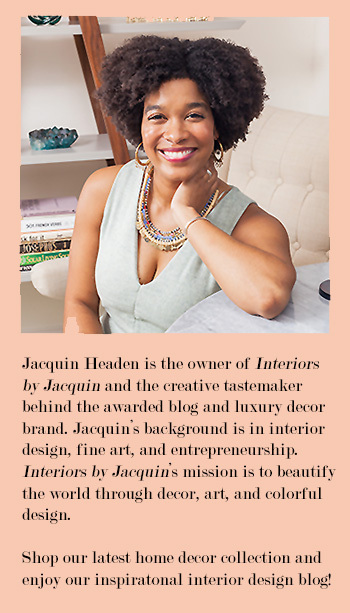 Interiors by Jacquin blog has been selected as a Top 100 Most Influential Interior Design Website of 2015! 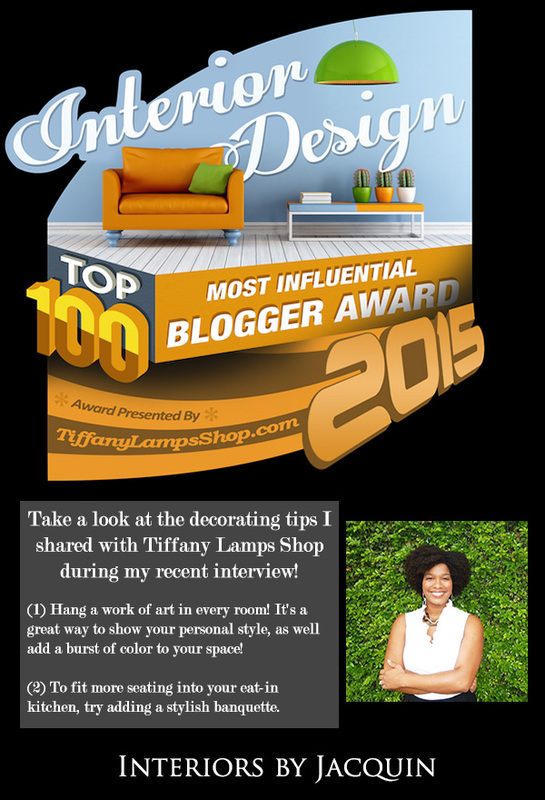 This blog has only been up for 8 months, so I’m honored to be included on this amazing list of interior design tastemakers. I’ve added their official award badge in my sidebar to the left and I’m looking forward to bringing you more exciting home & design content. Thank you so much for reading! Last weekend I attended the annual Etsy Craft Party and it was a blast! I met some amazing women, all of whom were awesomely creative and equally interested in crafting. So, a win for me! Etsy hosts several of these parties across the country once a year, so if you like crafting you’ll definitely want to catch you local Etsy craft party next year! In the meantime, get a taste of what this fun event is all about. I hope to see you at the next one! 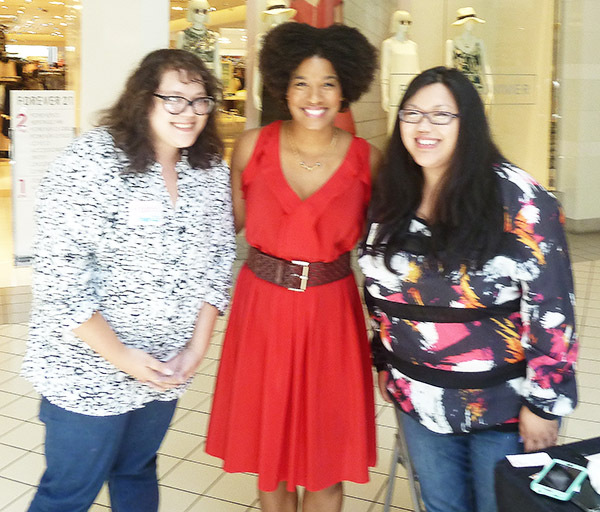 Here are some of the fab ladies I met at the Etsy Craft Party in Southern California! I met a blogging duo, Michelle and Andrea (above) of iFavor123 along with Stephanie Payan, the SoCal Etsy Guild coordinator (that’s her below). Take a look at some of the crafts we created while at the party! 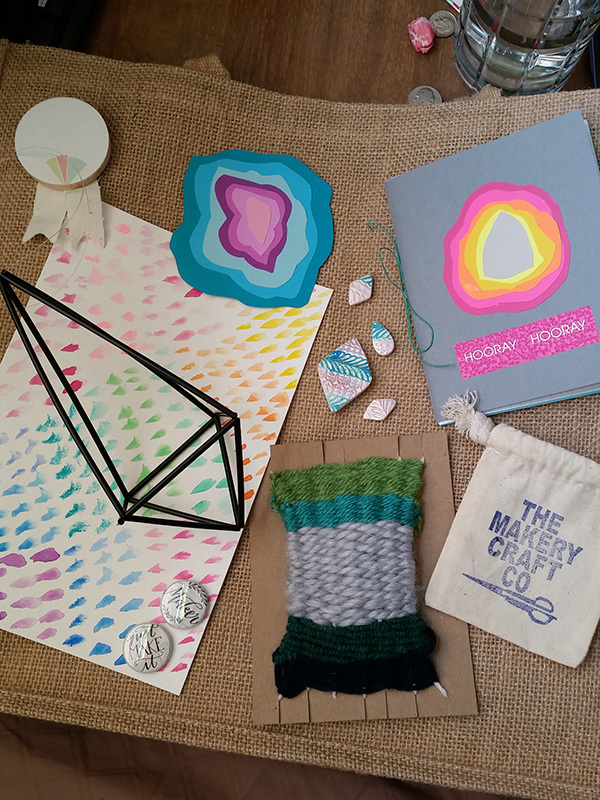 (Above) Collage Journals – We stitched together our own mini journals and then they encouraged us to make geodes from different shades of paper by Break + Remake. 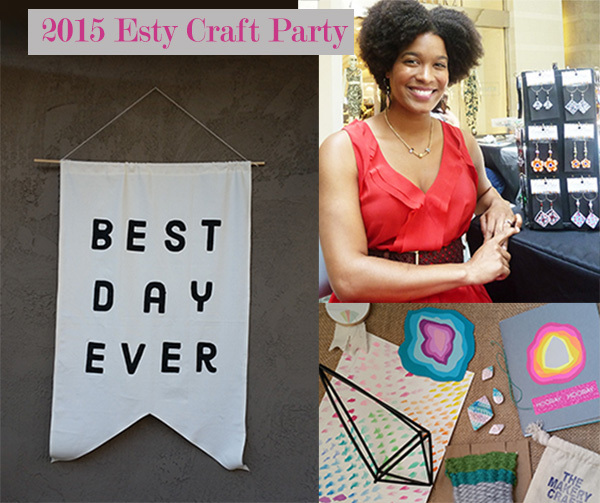 There were several great artisans and vendors at the Esty Craft Party. The coordinator, Stephanie, also has a hand-crafted jewelry shop! Take a look at her awesome engraved necklaces below. You can find more of Stephanie’s jewelry here. 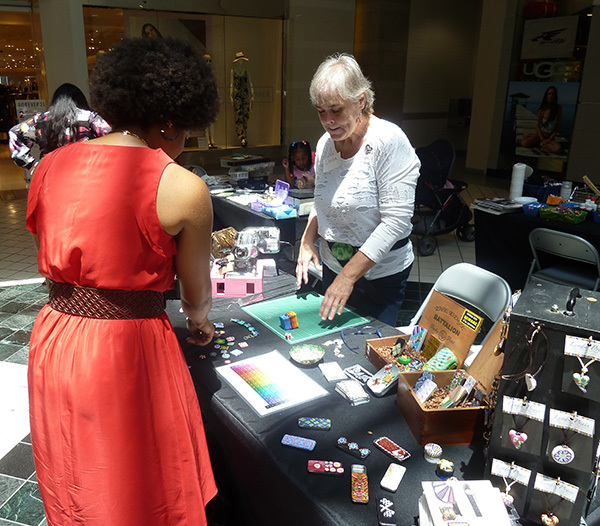 Another artisan and vendor I met at this fun event was Linda of Linda’s Art Spot. She creates beautiful and extremely intricate clay polymer jewelry and accessories. She also teaches art and is a creator within many art forms. She was such an interesting and warm person to chat with and I’m hoping to catch one of her art classes this summer! 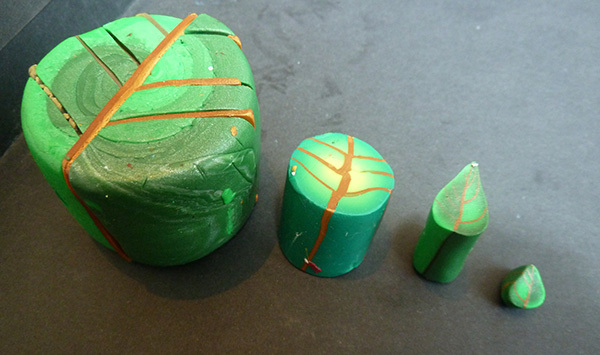 Linda creates her polymer clay designs by combining various colors of clay in large block form, intuitively placing colors next to one another to yield a specific design once the clay is rolled down. Then she cuts the block to expose the center artwork in the middle. It’s a quite a fascinating process! I’m glad to have had an opportunity to learn about this special art form. In the photo below, Linda shows us how her larger clay forms are worked down to the final design, like in this beautiful leaf design. 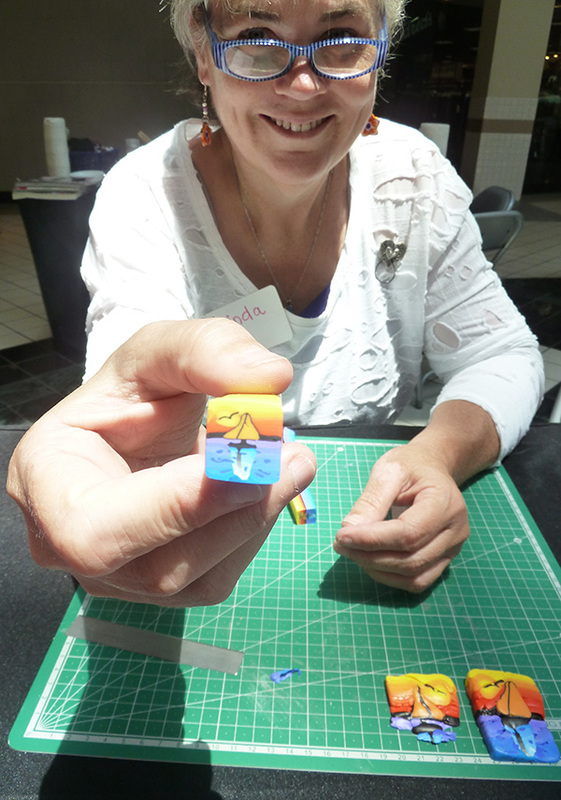 Many of Linda’s polymer clay designs are jewelry items like the special earrings you see me modeling at the end of the post, but she can create just about anything with this intricate technique. Here I am chatting with Linda and taking a look at her unique polymer clay accessories (above). 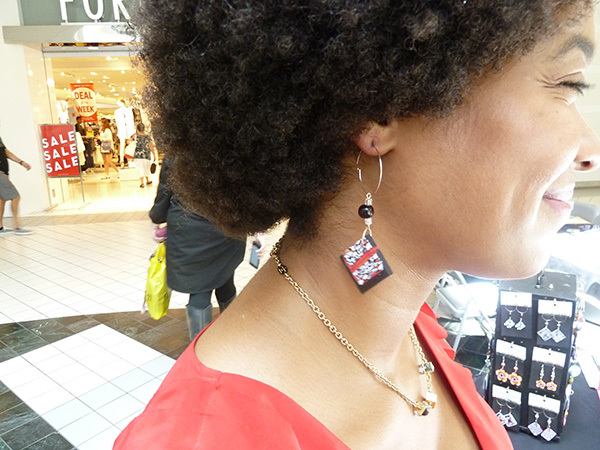 This was a fantastic event, but I must admit that chatting with Linda was one of my favorite parts, so it’s only fitting that I end this post on the Etsy Craft Fair with a photo of me modeling Linda’s one-of-a-kind earrings. These earrings matched my dress perfectly! This was my first time participating in The Etsy Craft Party and I will definitely be back next year. These parties take place across the country so be sure to check out their website here for information on the next party!